The following is a list of trips offered (mainly) by tour operators. You are able to go with the smaller independent operators scattered about town although do check if these smaller companies have adequate insurance to cover you in the event of personal accident or loss of personal property. You should also still ensure that you have your own travel insurance for maximum and ensured cover. 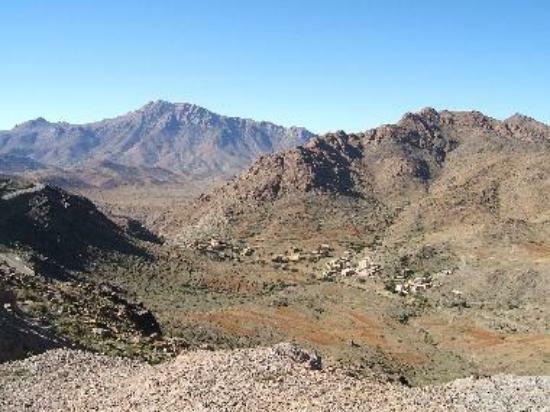 Tafraout & Tiznit – 7am – 7pm – up the Atlas mountains to see spectacular views; visit Tafraout with homes built into the rock; see an original “Agadir” which is a fortified granary; visit Tiznit, the former silver capital. Gets a bit dull halfway through as you become too familiar with the scenery. Tour operator price 490Dh. You can also do a trip to Tiznit by taxi from El Batwaar. Marrakech 2 days or 1 day. All tour operators offer trips to Marrakech which should not be missed. Starts at 6:30 am and ends at midnight. City tour may include medina, Jardin Majorelle, Jardin Menara, Bahia Palace, Koutoubia Mosque, Jemma el Fna square and souks. You are given free time to roam for a few hours before having a Moroccan dinner early in the evening with with belly dancer and musicians. Return to Agadir for midnight. Your stay in Marrakech is about 8 hours on the day trip. 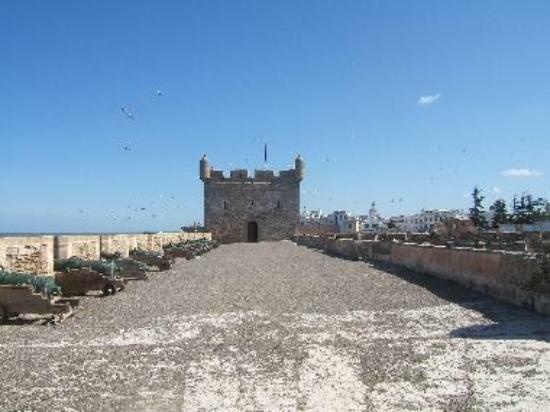 Tour operator price for 2 day trip costs 1550Dh (single room supplement chargeable at 175Dh) and includes a stop at Essaouira on the return journey. Should you wish to do this journey on your own, there are 2 reccomended and reliable national coach (bus) service companies. 1. CTM – Agadir to Marrakech costs approx 90 Dirham each way. For Timetable information visit: www.ctm.ma. The website is in French but is easy to understand. To obtain the timetables, click on the link on the main ctm home page and download the .pdf file. Remember to check the website periodically as there are sometimes small changes to the schedules. 2. Supratours – Coach operator Supratours have frequent daily services to Marrakech, the coach departs from the Gare Routiere which is the main bus station near Souk al Had. You should get a petit taxi (small orange vehicle) to the Gare which should cost about 15Dh. Buy your ticket from the Supratours office on Rue des Oranges at the end of Ave Hassan II in the tourist sector a day or two in advance to guarantee seats; the ticket will have the time of departure printed on it although departure times may vary and the new time will be written on the ticket. Your seat allocation will also be printed on the ticket but if it’s not crowded then choose your own seat as long as no-one objects. There are two routes to Marrakech; he old route through the mountains which is picturesque but the journey takes five hours so you ideally need to set off as early as you can manage. The journey will have a stop halfway for snack and use of toilet which will be somewhere in the mountains. For this route the fare is 90Dh. The newer and shorter route is via the recently opened motorway (toll road) and costs 100Dh with a journey time of three hours; this also departs from the Gare and there is no half-way stop. When arriving in Marrakech, buy your return ticket immediately as coaches can fill up fast; this may be unlikely as there are several coach trips throughout the day. When getting off the bus you may be approached by men trying to convince you that you need a guide, whether or not you take up the offer is your decision but you are advised not to use them as it is easy to get around with a reasonably good map; they will also offer to find you accommodation at a substantial increase so they can earn a hefty commission. If planning to stay overnight, you should ideally choose a riad (eg Riad Doha )within the medina which is the old part of the city surrounded by a wall. Riads can be pretty expensive, upwards of €45 is common. There are plenty of places to stay in the medina, guest houses called riads are very popular but you may wish to choose one closer to the main square, Jemaa el Fna, so as to avoid getting lost late in the evening as there are many winding side streets and at night lighting may be quite poor in some parts. Agadir to Marrakech: Supratours coach times 0400, 0830, 1330, 1829 and 2330. Marrakech to Agadir: Supratours coach times 0845, 1230, 1430, 1500 and 1900. Most tour operators do a day trip starting at 6:30am with return to Agadir for midnight so you get a good seven hours there with visits to main sites including lunch and Moroccan dinner. You are also let loose for a few hours to do your own exploring. 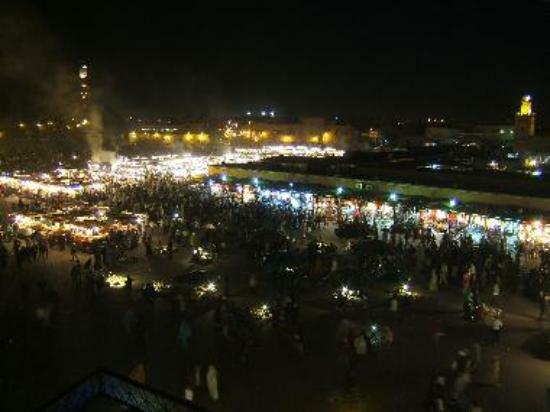 The down side of a day trip is that you miss the evening spectacle of Jemaa el Fna. The cost is around £50-£65 depending on the exchange rate. 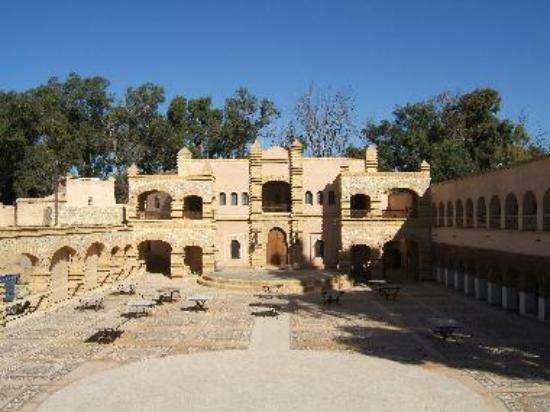 There is also a two day trip which includes a hotel stay overnight and stop at Essaouira on the return trip. This one costs about £120.00 per person but is a bit expensive when you could really do it all for around £70 per head. Organised day trips usually offer a discount of 50% for kids under 12 and for the 2-day trip there is a single person room supplement of £14.00. Massa by Landrover – 9am to 5pm – visit the South of Agadir (not quite into the Sahara), Massa Dam, Dunes of Resmouka, lunch in Massa, walk along the Massa River which drains into the Atlantic, stop at the beach at Sidi R’bat. Tour operator price 490DH. This is not an easy place to reach as the terrain is more sandy and requires a 4×4 or landrover. Immouzzer – 8am to 1pm – drive along the Atlantic coast through palm groves, green valleys, banana plantations and narrow gorges. Visit the Souk at Immouzzer. Tour operator price 280DH. Easy to get to from Agadir on your own by taxi as it takes uder 20 minutes to get to. Explorer of the South 2 days – The excursion begins with pickup from your hotel at 7am. The first stop is Tiznit which takes over one hour to get to from Agadir; here you have a coffee break and see a few sites such as the old town which looks rather run-down and neglected. You may be led into a silversmiths to watch jewelry being made in appaling conditions; young boys/men working in hardly any natural light and inhaling lead fumes from soldering. There is usually a smart shop attached selling overpriced jewelry whereby the guide gets a commission from anything sold. Tiznit is still heralded as the “former” silver capital of Morocco but now has nothing visible to offer on such a visit. After Tiznit the group heads to Amtoudi which is a palm valley with a well preserved 800 year old “agadir” or fortified granary before going through the Berber villages of Timoulay and Tarhjicht. By donkey you will travel to the Kasbah for lunch and then onto Bou Izakarn and then to Fort Bou Jerif where you have dinner and spend the night in a tent in open desert. After breakfast you continue to the village of Sidi Ifni and then onto the beach at El Gzira to relax or swim before having lunch. Continue on to the village of Mirhleft, back to Tiznit and finally returning to Agadir for 6:30pm the following day. Tour operator price 1520Dh (room supplement chargeable at 175DH). Berber Evening – 5pm to 11pm – very tourist oriented, like a production line from one scene to another. 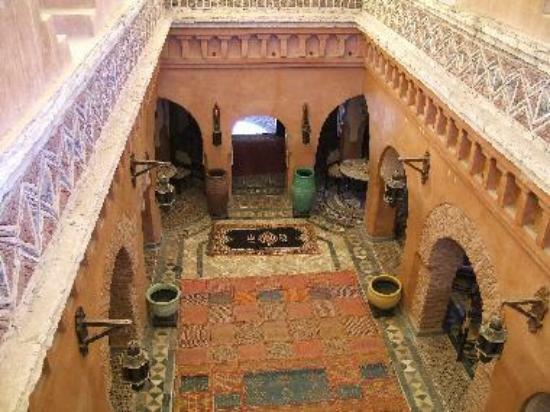 Have a three course Berber dinner (wine included) in a Kasbah, singing and dancing around an open fire. Tour operator price 300DH. Boat Trip – 9am to 5pm – learn to catch fish or just relax, chance to swim, moor off the coast for lunch with wine (included in cost). Typical tour operator price 420DH. You can ask at the marina where there are several boats moored offering this trip or for the more reckless, try a fishermans boat although these are very small and should you have an ccident, you will not be covered by insurance. 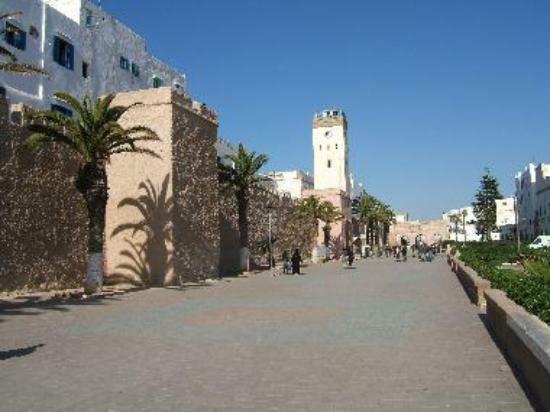 Essaouirra (aka Mogador) – 7am to 7pm – Old picturesque fishing port, worth a visit, see “flying goats” on the way, visit the Argan Oil production factory, view the Atlantic and surrounding islands from the ramparts, includes visit to the medina to see craftsmen making items from aromatic Thuja wood. A nice place with lots of character and very relaxing. Lunch included. Tour operator price 490DH. Very easy to do this yourself by getting the 8:30am bus from Gare Routiere near the souk (Souk Al Had) at a cost of 65Dh. The return time of the bus is 4:30pm and there is only one service each day. Taroudant half day – 9 am to 2 pm Or 1pm to 6pm – Pink walled city also known as “Mini-Marrakech”, since Taroudant is a smaller version of Marrakech (also less polluted, less expensive), with a slow paced life but with more friendly, hospitable and genuin people. If you are looking to be in a place with 100 monuments,Taroudant is not for you, but if you are into culture and want to learn and feel the real Morocco, this is the right place. If you go with a local tour company for an UNguided tour of the city, (and at times even with guides it’s the same story, so make sure you get a reputable guide if you intend on having one for the day) you will be more likely dropped off in a tourist oriented square to buy souvenirs at inflated prices. 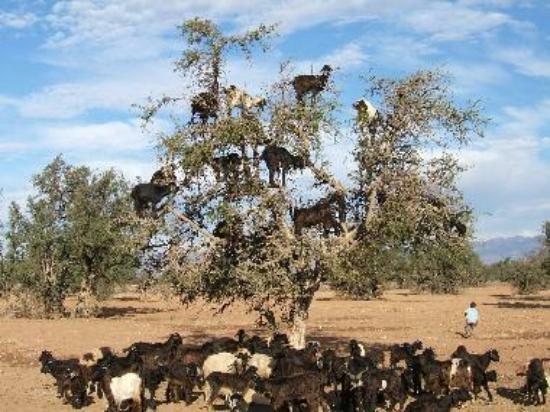 On the way to Taroudant, if on a coach trip, you will stop to see Argan tree climbing goats (as in the HSBC adverts) along the way; the owner of the goats will expect a tip, not 200 Dh as some people say, but a 10Dh or 20Dh tip is good enough. Stop for a drink and bathroom break in a local restaurant. Not very exciting for a typical tourist but relaxing nonthless. Avid travelers on the other hand will appreciate the genuine, enriched with history atmosphere of this town. Tour operator price 250DH. 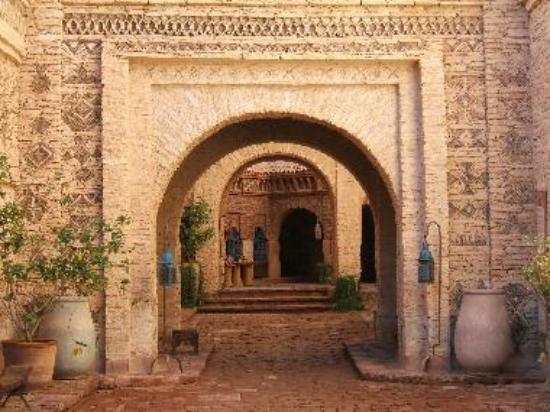 Private guided tours of Taroudant can cost a bit more but are special and custom as are planned according to one’s own pace and desires. Taroudant+Oasis of Tiout 9am to 6pm: Tour of Taroudant as above plus the oasis of Tiout 30 Kms east of Taroudant. Stroll through the palm trees, a donkey ride (mostly kids like this activity), panoramic views, and Tiouti Kasbah that belonged to a fomer Pasha, and where a movie of “Ali Baba and the fourty theives” was filmed in the 50s. Horse Riding or Camel Trekking – Everyday except Sunday, trek along the Souss River, suitable for beginners. Mint tea and pastries included on the Camel Riding. Same rate for both at 200DH. Camel riding is also offered on parts of the beach but you will have to haggle over the price and you will not ride on the beach. Horse and carriage – Roamantic excursion to Medina d’Agadir via the National Park where rare migrating birds can be seen. Mint tea included. Tour operator price 240DH.